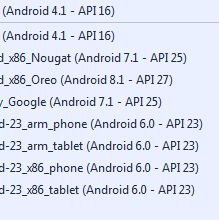 Our developer try to build a sample with android 7, but it looks we hadn't reproduced your issue in our test device. Please try it and let us know whether you can reproduce it by this sample. It compile and execute well, but i don't see any improvement in loading tiles the second time, so I'm not sure the cache is really used. Can you provide a workaround ? Open the Wifi or 4G network and get the cache file in the specified cache location. Close all networks and the app. Reopen the app and keep the network closed. The open street map imagery is still rendered on the map. Base on the above test, the SqliteBitmapTileCache works fine. I just open your project and it's targeting android version 4.4 (in tab Android Manifest). When our development team develop this version and test it, the target version is 4.4. We hadn't tested set the target version equal 7 after that. And yesterday we had tested that you set the target version equal 4.4, sqlite can works well in V7. Because it looks V7 set stricter limitation about Sqlite, our developer had planned to work and test for it in future version. So basically, in approx 40 days, no one will be able to publish a new app containing mapsuite cache on the android play store... I hope the futur version will come very soon. Thanks for your reminder, I will let our development team know it. August 1 is close now, do you have an ETA about this issue ? We will do our best to complete it before August 1. And I think your APP should follow the limitation of November 1. And we will release it in this week. Please try the beta version, if you still met any problem please let us know. We did some testing with the beta040 version, it works fine. We have attached the test sample, please try again. If there is any issue, please let us know that.